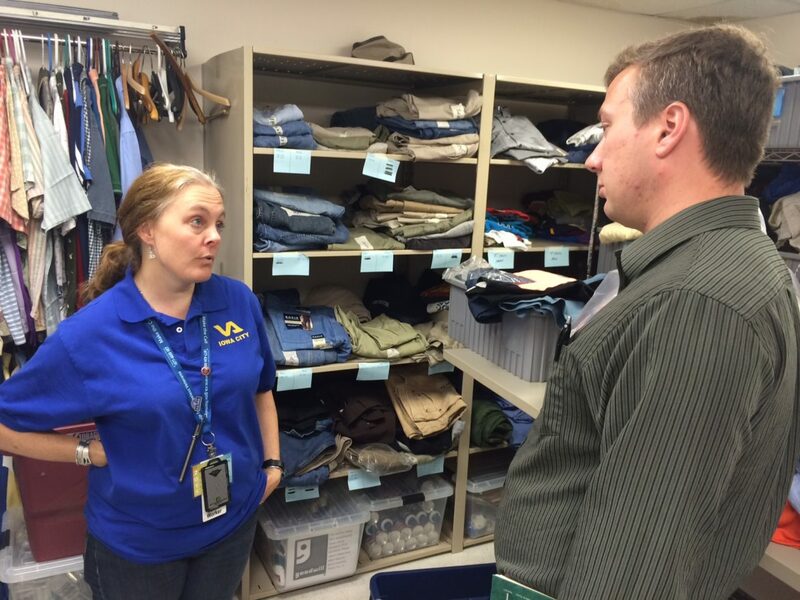 Sarah Oliver, homeless program coordinator in summer 2016 before moving to another position in the VA, shows IowaWatch intern Thomas Nelson the clothing pantry at the VA Homeless Outreach Center in Rock Island, Illinois, on June 9, 2016. As military veterans leave their positions in the armed forces, some face daunting reality of homelessness. Mental illness plays a large role in the difficulty to move back into the work force or to be able to live a normal post-military life, causing an increase to homelessness, according to a series of stories by IowaWatch summer 2016 intern Tom Nelson. Nelson, from Clinton and an Iowa State University senior in fall 2016, explained in this podcast that homeless military veterans do not take advantage of the resources provided to them or do not know about resources in general. Lyle Muller: This is Lyle Muller with IowaWatch. I’m with Tom Nelson, a summer intern with IowaWatch, in between semesters of his senior year at Iowa State University. 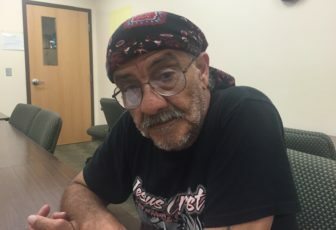 While with us, Tom did a story about homeless veterans and the disconnect between them and services that could be available to help them and also the difficulty in counting homeless veterans in Iowa. Tom, I want to start with why you think this story should connect with readers. Tom Nelson: Well, there’s a hidden segment of society that are people who are homeless and I think it’s important to shed some light on that segment of society. As a veteran, I found it was important to be able to talk about veterans that are also homeless and when you include as well the services that are out there to help veterans, it seems that there are so many opportunities for veterans to be able to get on their feet. When they don’t take advantage of that or when they don’t know they could take advantage of that, I think that creates something that people should know about and there should be a light on there. Muller: Were you surprised that some of the disconnect as veterans themselves, the homeless ones, not reaching out and trying to find services that they’ve been told exist? Nelson: No, I was not surprised because a certain degree, veterans are very self-confident. When you get out of the military, you have this confidence because you were able to achieve something as a soldier/airman/sailor/marine, and to ask for help after being able to take care of yourself during that time is difficult. I know from personal experience that when I got out of the Marine Corps, I didn’t think I needed to get help from anyone and that I was going to survive on my own. In the end, I knew to go ahead and ask for help. You know, staying in on my parent’s couch until I was able to figure out where I was going to get an apartment. Muller: And you were in the Marine Corps when and where? Nelson: I was in the Marine Corps from 2011 to 2015 and I was stationed at Camp Pendleton the entire time except for a great period of training. Muller: In your interviews, you saw that mental illness plays a large roll in some of these cases. Can you talk a little about that? Nelson: Yes, I think mental illness plays the biggest role in homelessness. It is a further wall between a veteran and the services that they can get. If you have PTSD and you’re are having flashbacks of situations, you are not going to necessarily always know where you are. And if you have depression or anxiety, you are not going to want to reach out to people to get help. You are going to want to stay closed in. That requires a certain amount of pro-activeness on the part of social workers who work with veterans as you can see with several of the social workers who I spoke with – Dusty Noble. Muller: And Dusty Noble is? Nelson: He works at HACAP with the Matthew 25 ministries. Nelson: Yes. And he makes a point, to go reach out to veterans to make sure to help them out and give them the services they need and to let them know about the services they need more of. Muller: And you were in Cedar Rapids. You went to Des Moines to a shelter there, a shelter in Davenport, to VA offices in Rock Island and Iowa City, quite a few places to talk to people. Army veteran David Turnbow at Iowa City Shelter House on June 22, 2016, where he was able to move forward from being homeless. Nelson: Absolutely. I went to as many places to talk to as many homeless veterans as I could. From Michael Washington in Davenport, a marine veteran who served pretty much before I did from 2007 to 2011, to David Turnbow in Iowa City, who I met at the free lunch, who has now been able to be housed. He was in the army from 1973 to 1992. You see all classes of veterans who aren’t aware of help or who are only finding out about help now, when it has been available since 2009. I think there is a certain degree that you want to be able to see these people get help and you want your fellowmen or any other human being have the same things as you do. And when that is not happening, there seems to be a problem. Muller: Did you have any difficulties with this story trying to find sources or trying to put together information? Nelson: Absolutely, when I was going out in Iowa City and the shelters, a lot of times, they don’t always have access. You are not going to have a consistent schedule when you are working when someone who is living on the streets. And so when you go in trying to talk to social workers, they are not going to have a consistent schedule. Moreover, some of the people who you talked to, who are homeless, aren’t always going to be homeless veterans even if sometimes they are homeless veterans, which I encountered in Iowa City. Muller: So a lot of vetting and also the number of veterans who are homeless in Iowa is relatively low, but you make a point in your stories that we don’t really know how many there are. That becomes important, too, for people that are trying to do services, is it not? Nelson: Yes, everyone one of the experts I have spoken to in Cedar Rapids, Iowa City, Davenport, and Des Moines, have all told me that they don’t know how many people are actually homeless and how many homeless veterans are on the street. According to them, you can’t actually know. And when the head count of homeless veterans is only covering four counties, I don’t think you can necessary know how many homeless veterans are out if you are only looking at four counties — those four counties being Woodbury, Polk county, Linn, and Johnson. Black Hawk County, where there’s Waterloo, is the six largest city in Iowa. Or Clinton County where you have Clinton, Iowa, which has a population of 30,000 people. You don’t know what that segment of the population is looking like as far of homeless veterans or homelessness in general. Muller: What’s the main takeaway of this story, you think? Nelson: I think the main takeaway is that we don’t know how many homeless veterans are in Iowa. And moreover, some of people that are homeless and who are homeless veterans, don’t always know what services there are. I don’t want say there is necessarily call to action, but if you know someone who is a veteran or you know someone who is a homeless veteran. Making a point to reach out and let them know this is where you can find this. These are things that are out there that you can maybe use to help yourself and get yourself housed, is important. Muller: Alright, thank you, Thomas. Iowa’s homeless veterans are missing services available to help them because many do not know about the services, which include financial and housing assistance. Others simply choose not to use them.